Recently we published an article that included points on how caffeine might help protect against dementia and Alzheimer’s disease. We received feedback on this, including a question about decaf coffee and what its role might be in all of this. RECOMMENDED: Coffee’s protective effects on endometrial cancer. The issue is that there are promising findings on coffee’s ability to ward off dementia, though it’s not clear whether it’s the caffeine or other compounds in coffee. One study tested caffeine, regular coffee and decaf coffee in the mice’s drinking water. It found that neither caffeine alone or the decaf coffee provided the same protection as regular coffee. dementia — yet even still, those on the regular coffee had higher levels of GCSF and performed better than the others in memory tests. It was the equivalent of four cups a day or so. So, in terms of decaf, this study would suggest it doesn’t hold the weight that caffeinated coffee does in shielding you from dementia. testing it to see if it improved insulin and blood glucose levels in mice with type 2 diabetes. After five months, the mice’s brains were able to more effectively metabolize glucose and use it for cellular energy. This effect is reduced in diabetics, and it is closely related to cognitive issues such as dementia. Thus, here we see that decaf coffee improves an aspect of brain function that could shield against dementia. 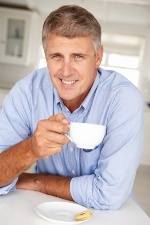 The takeaway message is that moderate coffee consumption could appreciably reduce your risk of Alzheimer’s disease, with which five million Americans are currently afflicted. At this point, researchers do note that regular caffeinated coffee consumption is the type with this beneficial effect, not decaf.